EMPORIA, Kan. – For the fourth time in five matches, the Seward County men’s tennis team (5-0) has won from a sweep, defeating NCAA Division II member, Emporia State on Monday afternoon. 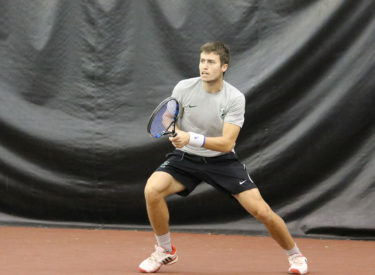 Seward took down the Hornets in order in doubles play. Nick Roussett and Hugo Lobodefeated Oli Dixon and Charles Gortzounian in the No. 1 spot 8-5. Duro Opacic and Tim Lamare defeated Matheus Mata and Paddy Cameron 8-3 in the No. 2 spot. Benji Finet and Carlo Izurieta defeated Janne Jacobi and Anton Levanovich in the No. 3 spot to end doubles and give Seward a commanding 3-0 lead heading into singles play. Rousett opened up singles play with a win over Gortzounian in the No. 2 spot 6-3, 6-0. Lobo quickly guarenteed the Saints victory with a 6-2, 6-4 win over Mata in the No. 3 spot. Opacic had a close match in No. 1 singles, but ultimately came out the victor, defeating Dixon 6-1, 5-7, 11-9. Franck Soulerot took the No. 6 spot over Taylor Nelson 6-3, 6-2. Lamare defeated Cameron 6-3, 7-5 in the No. 4 spot, before Izurieta ended the match with a tight 6-4, 2-6, 10-3 win over Jacobi for the No. 5 singles spot. The Saints will travel to Oklahoma City on Friday for a match up against NCAA Division II opponent Cameron University. WICHITA, Kan. – The No. 3 Seward County women’s tennis team dropped their first match of the 2018 season on Friday (Feb. 16) losing to NCAA Division II foe Newman University 2-7. The loss puts the Lady Saints at 3-1 on the season. The No. 3 doubles match finished first with Newman’s Niamh Packer and Liza Gerasimova defeating Seward’s Megan Petr and Yusra Hegy 8-0. Steffany Bermudez and Maria Aveiga were defeated in the No. 2 doubles spot by Vlada Litvinova and Kateryna Stoianova 8-0 to give the Jets a 2-0 match lead. Patricia panta and Alena Macharova gave the Lady Saints their first points of the match winning 9-8 over Janneke De Rijk. Panta and Macharova took the tie-break set 7-0 over Rijk and Young to win the No. 1 double spot. In the singles spot, Newman’s Packer defeated No. 50 Bermudez in the No. 4 spot to start singles, 6-0, 6-2. Hegy fell in the No. 6 spot 6-4, 6-1 to Mariana Gaviria before Liza Gerasimova defeated No. 14 Maria Aveiga in the No. 2 spot 6-3, 6-3 to guarentee the Jets victory. Emily Young took down Martina Borges 6-4, 6-0 in the No. 5 spot, while No. 8 Panta was defeated by Vlada Litvinova in the No. 1 spot 6-3, 6-1. The Lady Saints ended the match on a positive note, however, with No. 31 Alena Macharova winning handily 6-4, 6-3 over De Rijk. The Lady Saints now have an individual record of 24-12 in 2018. Seward will be back in action on Friday (Feb. 23) when they travel to Oklahoma City to take on Cameron University. WICHITA, Kan. – It was another dominating performance for the No. 3 Seward County men’s tennis team as they swept NCAA Divisoin II member Newman University 9-0 in Wichita on Friday (Feb. 16) to move to 4-0 on the season. The No. 2 doubles team of Tim Lamare and Duro Opacic give the Saints the first win of the match, beating Lauri Soome and Lucas Norbiato of Newman 8-1. No. 1 doubles of Nick Rousset and Hugo Lobo defeated Newman’s Blake Crawford and Szbin Pusztay 8-4 to give the Saints a quick 2-0 lead. Carlo Izurieta and Benjamin Finet cleaned up the No. 3 doubles spot with an 8-2 win over Diego Rojo and Enrique Corias of Newman. In the singles matches, No. 8 Duro Opacic defeated Lauri Soome in the No. 1 singles 6-1, 6-2 to push the Seward lead to 4-0. No. 48 Hugo Lobo defeated Blake Crawford 6-7, 6-4, 10-3 in the No. 2 spot to guarentee the Seward victory. No. 4 Nick Rousset came away with 7-5, 6-3 victory in the No. 2 spot over Lucas Norbiato. In the No. 4 spot, Carlo Izurieta defeated Szbin Pusztay 6-5, 6-7, 11-9. Benjamins Finet and Franck Soulerot rounded out the evening with wins in the No. 6 and No. 5 spots. Finet defeated Ajani King 6-2, 6-4 in the No. 6 spot before Soulerot ended the day with a 6-3, 6-7, 10-3 victory over Coiras. The Saints are now 35-1 in their individual matches this season. Seward will be back in action at 1:30 p.m. today (Feb. 19) traveling to Emporia to take on Emporia State.